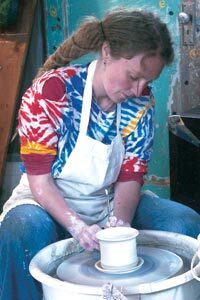 Come and check out the funky purple garage filled with vibrant, one of a kind functional and sculptural clay works by various Kootenay potters. We at Dog Patch Pottery truly understand the importance of a mug that fits just right in your hands, invoking a cozy feeling, or the delight of hanging an unforgettable mask on that wall that just needed something. That’s why we work through a process of loving creativity, providing you with a high quality of art and function.